The Qatar Football Association (QFA) has said it will begin to use vanishing spray – a referee’s tool to ensure fair play during matches – this week, as the Qatar Stars League kicks off on Thursday. 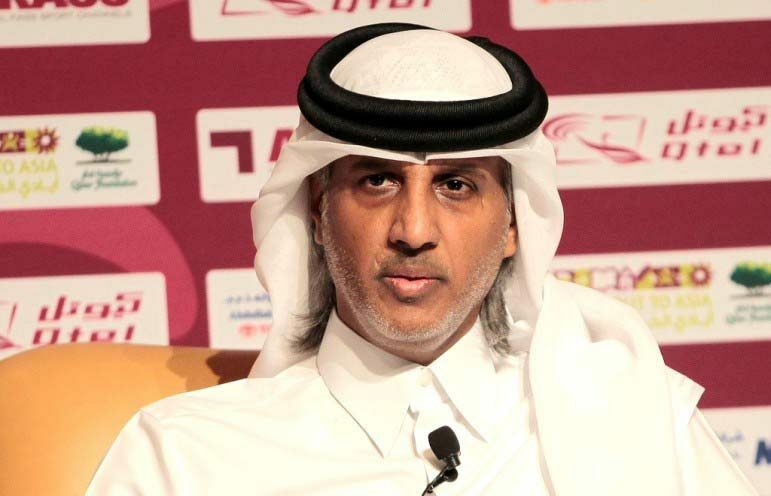 QFA said it will be the first among Arab and Asian leagues to embrace the tool, and will be using it in its Qatar Stars League, Emir Cup, Qatar Cup and Qatargas League. Vanishing spray has been used in other countries for years, but made its first major international debut at this year’s FIFA World Cup in Brazil, when referees used it to mark the placement of footballs and defensive players during free kicks. Circling the ball with white foam, which looks like shaving cream but vanishes into the grass in under a minute, ensures that the attacking team doesn’t move it away from where the penalty kick was awarded. After pacing 10 yards in the direction of the attack, referees must also draw a line across the field to indicate where players making up the defensive wall are to stand. The line ensures that players don’t encroach the mandated 10 yards. Overall, the use of the spray is said to prevent unnecessary delays through easily monitoring the action of players, ensuring that they are following the rules of the game. 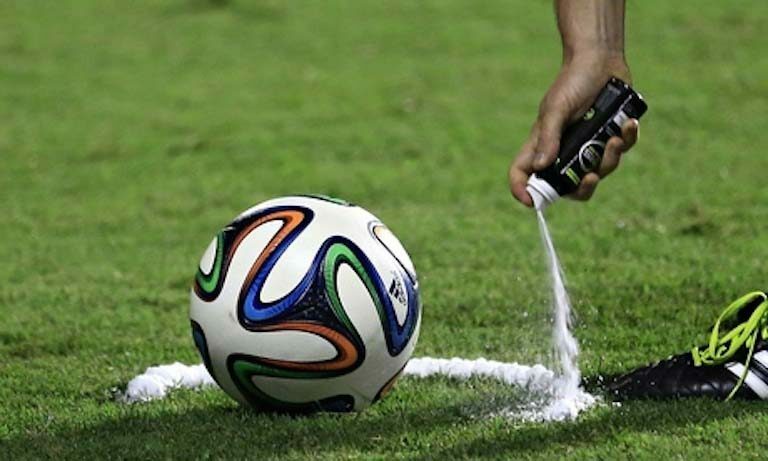 This version of the spray was invented by Brazilian Heine Allemagne in 2000, and was inspired from the idea of using a temporary shaving-foam, as football rules and regulations disallow additional permanent markings on the pitch. Allemagne worked with a cosmetics lab to figure out a formula for the spray. Considering the conditions it would be used in, Allemagne had to ensure that the spray wouldn’t harm a player’s skin or the grass. Although the spray consists of some unique characteristics, the key ingredient is something simple: vegetable oil. The oil is said to be the catalyst in the spray disappearing as quickly as it does. In order to use the spray, leagues must acquire authorization as well as referee training. QFA referees have just returned from training abroad, learning how to use the spray and how to monitor its use throughout games, a spokesperson told Doha News. Although the tool has been used by smaller leagues in previous years, the spray’s success during the 2014 World Cup has apparently spurred global appreciation. A number of leagues are now jumping onboard and plan to use the tool in upcoming games. Several top leagues are expected to begin using the spray this season, including the UEFA Super Cup, Champions league and Europa League, the Premier League in England, La Liga in Spain, Serie A in Italy, Ligue 1 in France, Bundesliga in Germany and A-League in Australia. The spray will also be used during the European Qualifiers for UEFA EURO 2016, which starts in September. “We would like to stress that QFA Referees Committee requested the provision of the vanishing spray in April 2014, before the commencement of the World Cup. QFA took the necessary procedures to supply this technology within the frame of the continuous support towards Qatari refereeing. According to QFA, the association uses a number of up-to-date refereeing technologies, including wireless devices, additional assistant referees, an upscale system used to monitor the physical fitness of referees and installed video cameras on the pitch for immediate performance analysis during training sessions. QFA is also kicking the season off with a new ticketing scheme. From now on, fans have the option of buying a season ticket for QR200, saving fans a total of QR60 (or three matches). The ticket is only available for the Qatar Stars League, however. QFA has also said that season card holders will be eligible for rewards from loyalty partners Qatar Airways, InterContinental Hotels Group and Fitness First Qatar. Tickets can be bought online or from stadium VIP entrances on match day. Effective next season, professional football teams in Qatar must consist of a maximum number of three foreign players and a minimum of eight local ones, the national football association has announced. The number will be reduced further to two players in the 2015-2016 season, according Doha Stadium Plus, which cited a new roadmap released by the Qatar Football Association this week. From 4 to 3 foreign players starting next season; with 8 #Qatari players on the pitch, confirms Sheikh Hamad, #QFA president. This is a change from the four-player cap that was previously in place, and comes as Qatar tries to shape a national team for the 2022 World Cup. According to DSP, most football clubs in Qatar are against the new restriction. Some 15 out of the 18 teams expressed opposition, in part because of the talent foreign-born players bring in. As part of its road map, QFA will also focus on developing young local players, training more Qatari referees and coaches and reaching out to the community to bring in fans.